Whether you are an experienced diver or have never dove in your life this is one on a life time opportunity to explore the extensive marine life on the Northern Pacific coast of Costa Rica. Prior to diving in the ocean you get to do a 20-30 minutes pool practice with full dive gear, and once you dive in the ocean you will be supervised by a dive master at all times. 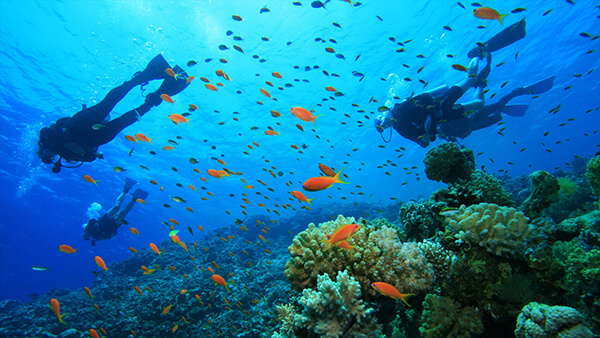 The maximum depth of the dive is 40ft. Two tank dive at the Catalinas: For certified divers we offer a two tank dive at a local rock formation located a few miles off the Flamingo Coast. We will dive in two different locations with an interval of approximately 45 minutes between dives. Taking It Seriously? You can also get an Open Water Certification in as little as four days! On the first day of the course you will get a pool demonstration & practice. On the second day the focus is on theoretical testing. On the third day you will get to dive in the ocean in 40ft depth and on the fourth and last day you will be getting your open water certificate that will allow you to dive in 60ft to 80ft deep waters. Including boat ride, tanks, BCD, wetsuit, fins & masks.